Building on the success of the booklet-based tool, the EI now offers Understanding your culture as a web-based survey, allowing you to easily gain a snapshot of the safety culture across the organisation. Easily survey a large cross-section of your organisation: best suited for surveys of 100 people or more, it is conducted entirely online; simply click a link to begin the survey. Analyse results by location and occupational level: customised reports are produced and emailed to you once all responses have been collected. Ideal for benchmarking and tracking progress. Have better discussions with staff: by conducting the survey in advance, it will not only provide you a wealth of information to use, but will give more time in workshops for discussion (and more to talk about). Target solutions at specific areas of the company: gain an understanding of where there are issues that need addressing. 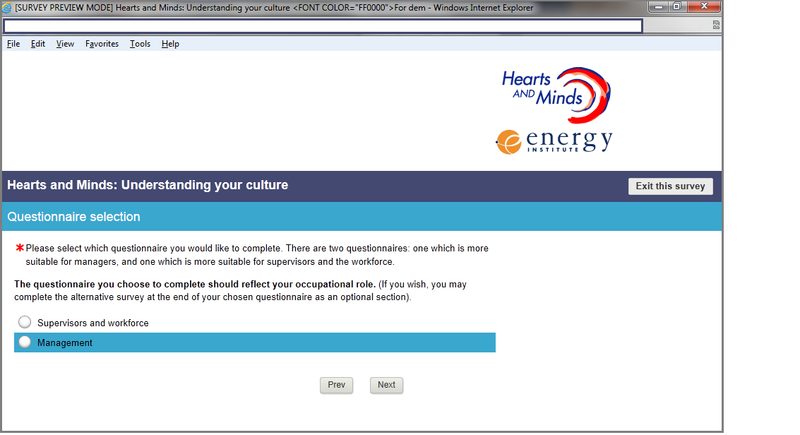 A selection of the workforce completes the Understanding your culture online survey on their own using a PC. Once the survey deadline has been reached, the results will be compiled into a detailed report, which can be used to help target solutions to different parts of the business. The results should be fed back to staff and workshops held to discuss and debate the results. Workshops will help you understand your culture better, understand which issues you should focus on improving, and generate ideas for improvement. Prices for this tool start at £937.50 for Energy Institute company members and £1250 for non-members, which includes a survey and report for up to 100 people. Packages can be tailored at additional cost to include organisation specific questions and challenges.